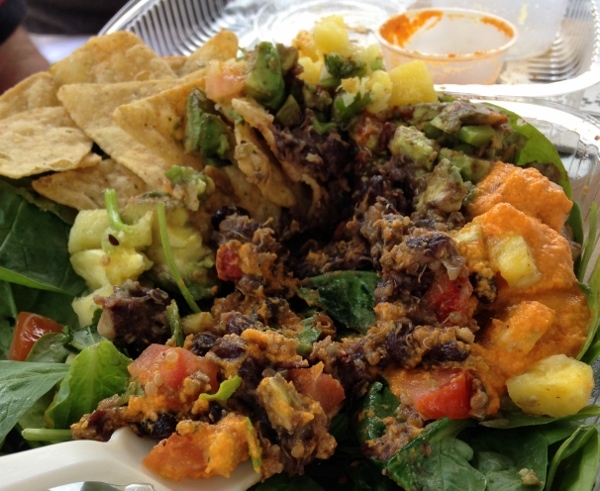 When traveling do you find yourself indulging in foods that you don’t eat everyday at home? I definitely do! I struggle to eat fresh fruits and veggies while traveling and don’t have a green juice or smoothie often enough. This Summer I’ve been working hard to change that. 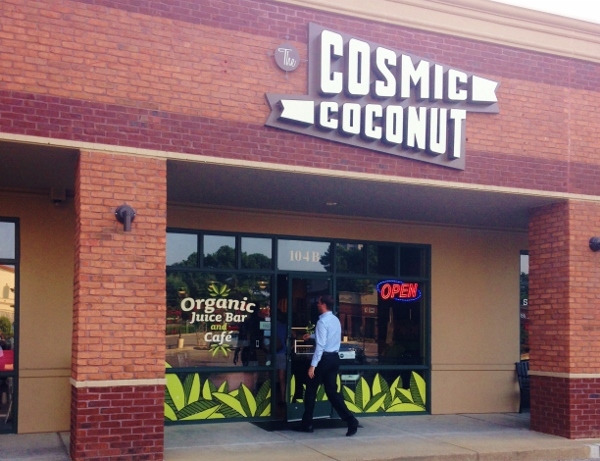 On a recent visit to Memphis, Tennessee, Cosmic Coconut helped me stay on track. We planned to leave Memphis early on a Monday morning on a group drive with several hundred cars, part of MINI Takes the States. The folks at MINI are terrific to provide food for all of us, but it doesn’t always work with my nutritional needs. (Sometimes it does so very well, though. More on that soon…) I had already been on the road for a few days and knew I needed to focus on getting food into my body that would keep me healthy. I also needed a picnic lunch to eat, as the day’s planned lunch stop was at a drive-in BBQ spot several hours outside of Memphis. Cosmic Coconut to the rescue! I phoned them ahead of time to make certain I could pick up lunch during their breakfast hours and was assured I could. Terrific! We planned to grab plenty of juice and lunch. 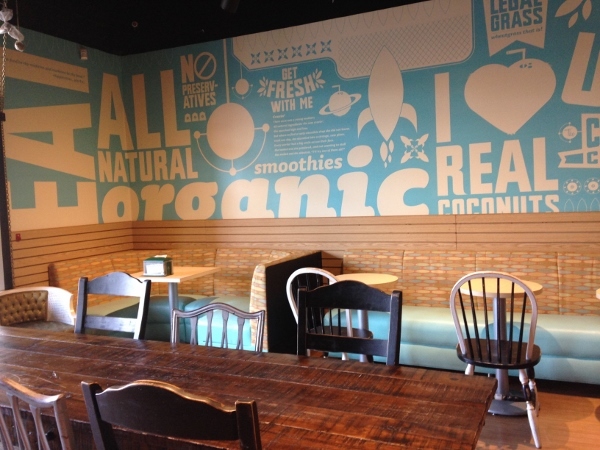 As we pulled up to Cosmic Coconut, I noticed how bright and happy everything appears. Not an easy task in a strip mall! Inside is very inviting, plenty of spots to sit and enjoy a juice or a meal. While we waited for our juice and lunch to be prepared, I saw a few folks come in to pick up a full day or two of juice, probably doing a cleanse. 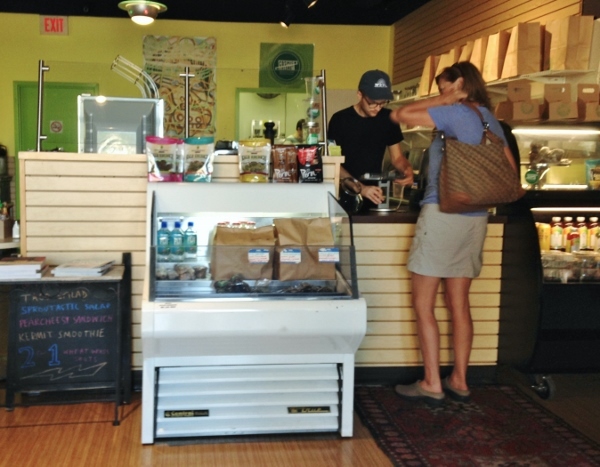 I also got the chance to talk to the owner, who is super knowledgeable about the food and juices they are serving. So nice to find a spot like this while on the road! I kicked the morning off with a Go Green juice with cucumbers, apple, celery, kale, lemon ginger and some extra ginger…because I like a lot of ginger in my juice. They were happy to make it just how I like it. My favorite fella had the Immunity juice with pineapple, orange, lemon, ginger, cilantro and cayenne. Spicy! 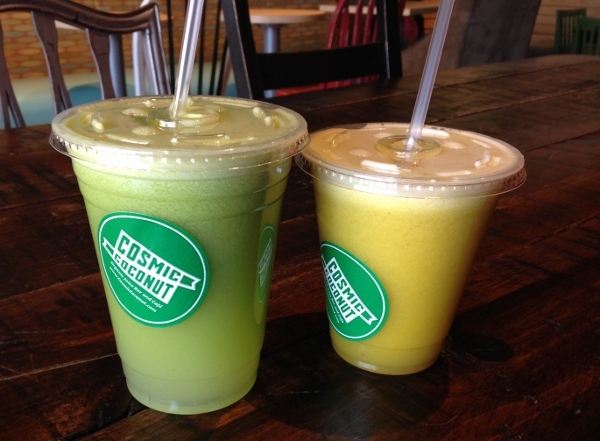 Here’s a travel tip for you: when you find a gem like Cosmic Coconut, pick up some bottled juice. Stick them in your travel cooler and you’ll have a healthy boost handy for 2-3 days down the road. The swell folks at Cosmic Coconut even offered ice packs to me for my cooler! I made it all the way back to KC with my last bottled juice from Cosmic Coconut. 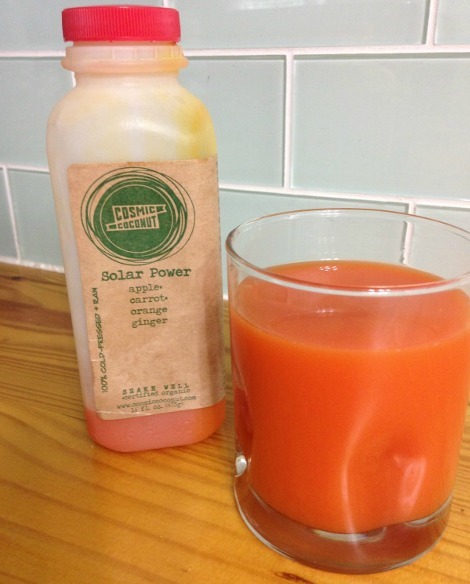 The Solar Power juice may be my favorite of the flavors I sampled. If you are looking for more tips on where to eat and places to check out while in the incredible city of Memphis, visit this post. I enjoyed my time in Memphis and hope you’ll get a chance to visit! EAT WITH: Minimal caution. The staff is super well-informed about dietary concerns and did their best to make sure I ate safely. Cosmic Coconut is located at 5101 Sanderlin Avenue, #104B, Memphis, Tennessee, 38117. 901.729.7687. Parking is plentiful, as Cosmic Coconut is in a shopping area. Disclosure Statement: This post contains affiliate links to products I own, use and believe in. If you should purchase one of these products, I may make a small commission. You still get the same great price. Affiliate links allow me to continue creating original recipes tested in my own kitchen and creating additional content for this blog. I can’t tell you how grateful I am for your support! !